Here’s an exciting update on a great doll house we’ve had our eye on here at Babyology for some time now. Last year at the ABC Kids Expo, we had a sneak peek at the fabulous Eco Sunshine Dollshouse. Well you can now buy it here in Australia so it’s available for me, I mean my daughters, to get their hands on. 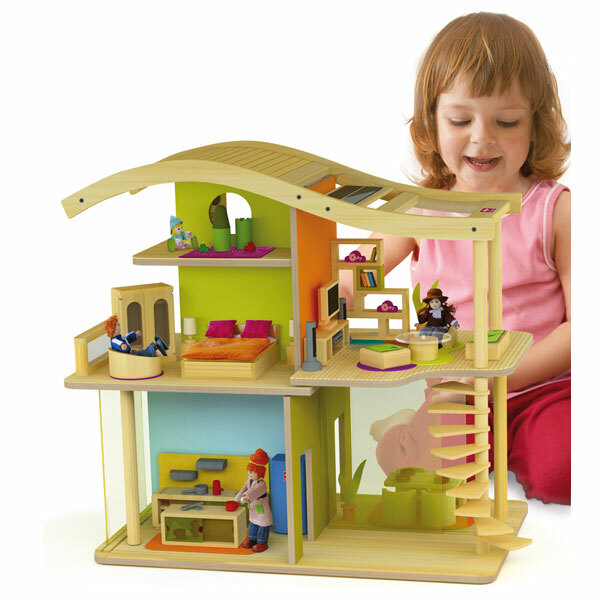 The Eco Sunshine Dollshouse by Hape has three levels boasting nine rooms. The whole lot, including the dolls and all the furniture, is made from environmentally friendly materials. There’s even a working solar panel which recharges the batteries that power the LED lighting! Bright and colourful, this is a great investment for girls and boys alike. What’s more, Australian stockists Happy Little Hippos are offering a great introductory deal while stocks last. You get the basic house with the bedroom, living room, kitchen, bathroom, kids’ room and garden sets, plus the family of five who live there for $650. Phew, that’s a big deal!